Anxiety is a condition that plagues millions with Social Anxiety Disorder currently the world’s third largest mental health issue. While previously stigmatized, the prevalence of this type of disorder has helped bring the issue of mental health out of the shadows. According to government data, approximately 7% of people, with a lifetime prevalence of more than 13% of people, report being socially anxious. For this reason and many others, it is important to gain a better understanding of the disorder and how it can best be managed. While many people tend to get nervous before a big speech or meeting, social anxiety runs much deeper. Social anxiety is described as the fear of certain social situations involving interaction with others. The cause of the fear may differ with the individual; for instance, you may fear being judged negatively by others. The disorder can be considered chronic as it does not go away without treatment. If you are suffering from a socially anxious personality, you may find it difficult to maintain relationships and an active social life. Living with the condition can also make it difficult to attend school, a job or other important events. Approximately 15 million American adults are living with this disorder today, and around 36% of people with social anxiety disorder admit to experiencing symptoms for a decade or longer prior to seeking help. Like many mental health disorders, social anxiety can be the result of environment, genes or a convoluted combination of the two. Anxiety disorders may arise from inherited traits passed on from family members, for instance. There is evidence to suggest that social anxiety disorders are the result of learned behavior. You might have developed social anxiety after seeing anxious behavior in others. There might also be a correlation between these types of anxiety disorders and being raised by parents who exhibited controlling and/or overprotective behavior. Some cases of social anxiety can be attributed to brain structure. One structure of the brain, the amygdala, is associated with the brain’s fear response. An overactive amygdala can cause a greater fear response, which may lead to heightened anxiety when confronted with certain social situations. What Are the Risk Factors Associated with a Socially Anxious Personality? While symptoms of social anxiety can begin in childhood or adulthood, it most commonly begins during the teenage years. Children who have experienced bullying, teasing, rejection or ridicule may be more prone to conditions like social anxiety disorder. Other events, like sexual abuse and family conflict, may also be associated with anxiety disorders. Being observed while doing something. Living with certain health conditions can also increase the risk of developing social anxiety disorder. 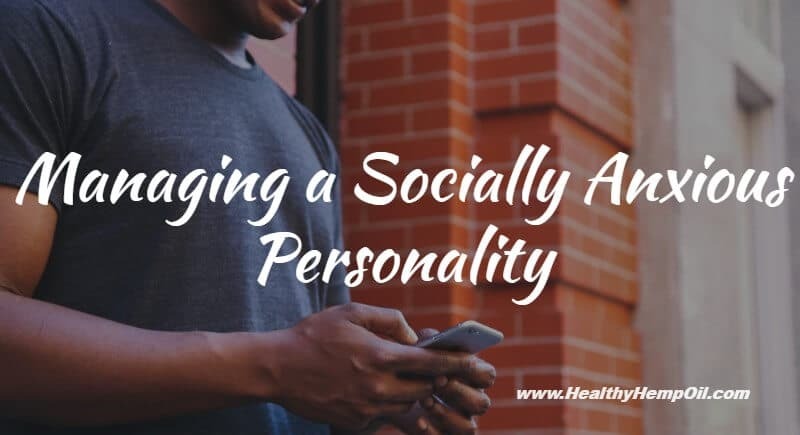 Facial disfigurement, Parkinson’s disease or stuttering are just a few examples of conditions that may cause someone to feel self-conscious, which can trigger an episode of social anxiety. How Can I Manage My Social Anxiety? There are various methods you can utilize to alleviate both the mental and physiological symptoms associated with social anxiety disorder. Effective management of your social anxiety depends on the severity of your phobia. While it is common to use antidepressant or anti-anxiety medicine to help alleviate the symptoms associated with a socially anxious personality, there are other methods that can help manage symptoms. Behavioral treatment has been shown to have long-lasting benefits for those living with the disorder. Therapies such as direct cognitive-behavioral therapy can help alter the state of the brain, which, in turn, can overcome social anxiety. Cognitive behavior can help you alter the thought patterns associated with your phobia. Once you understand these thought processes, you may be able to replace your panic-causing thoughts with others. Exposure therapy, or systematic desensitization, can be highly effective in helping combat phobias. When using this method, you’ll be asked to relax and then imagine things that tend to cause your anxiety, working your way from the least fearful to the things most likely to cause fear. Gradually exposing yourself to these situations can help you overcome your anxiety. Making certain lifestyle changes can also help reduce the systems associated with your social anxiety disorder, from engaging in regular exercise to getting enough sleep and sticking to a regular eating schedule. Reducing or eliminating caffeine use and other stimulants, like cold medicines, can also be helpful. Social skills training may be another effective method to manage your social anxiety. Group therapy will allow you to practice your social skills while activities like role-playing can help you be more comfortable dealing with others in social situations. An increasing number of people are turning to natural methods, such as anxiety breathing exercises, to help alleviate the symptoms associated with social anxiety. Not only do these methods eliminate the side effects associated with some prescription medication, but some all-natural products can also complement diet and well-being. Educating yourself about the intricacies of social anxiety disorder is the first step toward proper management. If you or someone you know is dealing with social anxiety disorder, it may be time to explore other management options that can help you lead a happy, healthy and fulfilling life. How do you manage your social anxiety disorder? Please share your tips in the comments below.